In case you haven’t read the news for the past 10 minutes, there has been a massive ransomware attack called Wana Decryptor that’s caused a great deal of harm. Let’s take a look at what the ransomware attack does, who is behind it and how to prevent it. Ransomware is an application that installs itself onto your computer without you being aware of it. It then encrypts your data, which is held captive unless you pay a certain amount of Bitcoin — a ransom, hence the name. Ransomware has become a more and more common way for hackers to make quick cash, and its effects can be devastating. This 2017 Ransomware Attack actually exploits a security flaw in Microsoft Windows products. Specifically, this attack relies on an NSA exploit that was made public in one of the Wikileaks releases. 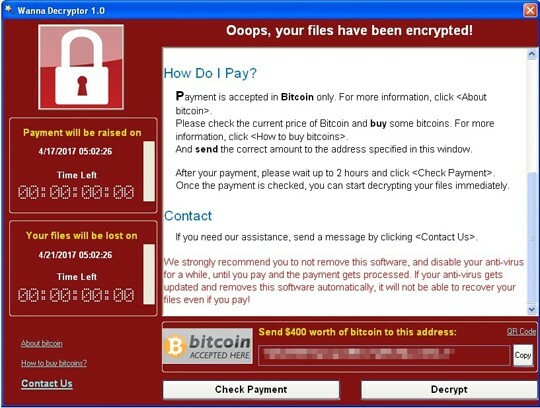 The ransomware’s name is WCry, but is also referenced online under various names, such as WannaCry, WanaCrypt0r, WannaCrypt, or Wana Decrypt0r. Wana Decryptor installs itself on your system and then demands $400 worth of Bitcoin. If you don’t pay up, the amounts increase, until, after 7 days, your files will be inaccessible forever. Am I vulnerable to the Ransomware Attack? If you’re using Windows, and you haven’t updated your OS after March, you’re open to the exploit and should take action immediately! Also note that if you’re using an operative system that is no longer maintained (such as Windows XP) you are vulnerable too, and there’s not much you can do at this point to protect yourself. But let’s take a look at how to secure yourself against the Wana Decryptor ransomware. How Can I Prevent the Ransomware Attack? You should update Windows to the latest version immediately. Specifically, this is the fix to this SMB exploit that’s been used by the Wana Decryptor. It’s also a good idea to always keep updated backups of your important files. We recommend to keep a copy with you locally, and a copy remotely, possibly in the cloud. Services like DropBox are inexpensive and work well for a limited number of files, just the most important stuff. Keep checking back with WishingDwell for the latest developments!